The first pictures have emerged of cracking in the graphite bricks which make up the core of nuclear reactors at Hunterston B Power Station in Ayrshire. Reactor three has not produced electricity since cracks were found to be forming more quickly than expected. About 370 hairline fractures have been discovered which equates to about one in every 10 bricks in the reactor core. Owner EDF Energy says it does intend to seek permission from the Office of Nuclear Regulation (ONR) to restart. It first has to prove it can still shut down the North Ayrshire reactor, which has not produced electricity for a year, in all circumstances. 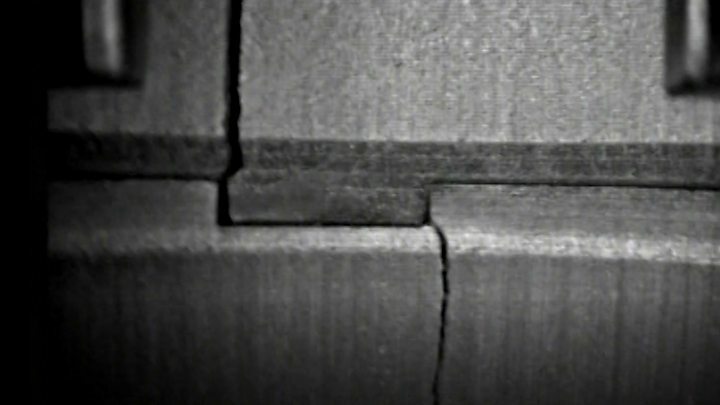 The graphite bricks form the vertical channels within the reactor where the nuclear fuel is housed. They sit alongside narrower channels where control rods can be dropped into place to counteract the nuclear reaction. Tests and modelling have been undertaken to ensure that an earthquake would not distort the control channels and prevent the power station being shut down. Image caption Hairline cracks just a couple of millimetres thick have been found on 370 graphite bricks. This picture shows two such cracks - the dark vertical lines. Station Director Colin Weir told BBC Scotland: "Nuclear safety is our overriding priority and reactor three has been off for the year so that we can do further inspections. "We've carried out one of our biggest ever inspection campaigns on reactor three, we've renewed our modelling, we've done experiments and tests and we've analysed all the data from this to produce our safety case that we will submit to the ONR. "We have to demonstrate that the reactor will always shut down and that it will shut down in an extreme seismic event." The operational limit for the latest period of operation was 350 cracks but an inspection found that allowance had been exceeded. EDF plans to ask the regulator for permission to restart with a new operational limit of up to 700 cracks. The company accepts that the cracking is 'life-limiting' for the reactor but will not say what it believes to be a limit beyond which it would be unsafe to operate. Hunterston Q&A: What do cracks mean? Mr Weir added: "We have demonstrated our operational allowance, we've demonstrated our safety allowance. This cliff edge is still to be demonstrated. It has got a huge safety margin before we are anywhere near a cliff edge." When operational, the two reactors at Hunterston B provide a base-load of electricity which is enough to power 1.8 million homes. It has an advanced gas-cooled reactor (AGC) similar to those at Heysham 1 and 2, Torness, Hartlepool, Hinkley Point B and Dungeness B. The industry expects all 14 reactors to eventually be decommissioned because of the cracking. Image caption The two reactors at Hunterston B can generate enough electricity to power 1.8 million homes. Nuclear expert Prof Neil Hyatt from Sheffield University said: "The structural integrity of the graphite core has always been known to be the ultimate limiting factor to the lifetime of these reactors. So, ultimately there may come a point in time where those reactors have to come offline and are not able to restart." Hunterston B is expected to continue producing electricity until 2023. If it were forced into decommissioning early because of the cracks - with others following suit - it could cause serious energy supply problems. With construction of a wave of new nuclear power stations running into difficulties, it would probably mean more of our power coming from fossil fuels such as gas. Concerns have also been raised about the consequences for local jobs if Hunterston closed early. It supports around 700 posts. Councillor Tom Marshall said: "Most of the large employers round about here have disappeared - from Greenock all the way down to Kilmarnock - and this is one of the last major employers. "So, if it is safe to run most people locally would be happy to see it running." Hunterston Q&A: What do cracks mean for future of power plant?